Do you dread dinner time with your toddler? Don’t worry you’re not alone! Toddlers are renowned for their picky eating habits, often turning mealtimes into a constant battle. You want them to eat healthy, but every time you present something that’s even remotely nutritional, you’re faced with tantrums, they refuse to eat it and worse – it ends up all over the floor! If you’re tired of the daily battles, there are some tips and techniques you can try out. Here you’ll discover the top 10 tips brought to you by parents and experts, who know all too well the frustration toddler mealtimes can bring! Ok, so there’s not much your toddler can do in terms of meal preparation. It’s not like they can rustle up a delicious three course meal. However, getting them involved in even the smallest of tasks can encourage them to eat new foods. Asking your little one to help pass you things and supervising them while they stir or pour ingredients will help them feel more involved. A large part of the daily food battles is the fact your toddler is gaining more independence and they want to be in control. When you simply serve them up a plate full of food they’ve never seen, have never tried and have had no choice in whether they want it or not, the automatic response can be to refuse it. So, getting them involved makes them feel like they actually had a choice and it makes them feel more independent. One of the biggest mistakes parents make is giving their toddler too much food. It’s easy to forget that their little tummies can’t eat the same amount that adults can. Even when you think you’re serving a small portion, it could still be too big. So, it helps to familiarize yourself with correct toddler portion sizes. In terms of new foods, it’s also a good idea to start off small. Some parents swear by introducing a very small portion of new food, quickly followed by a firm favorite. For example, if you want your toddler to try blueberries, give them a single blueberry to try, then after they eat it give them a larger portion of a food they love. The next day, try them with two blueberries and less of the food they love. When the portions start off really small, it isn’t as daunting for your toddler to try them. It’s worth keeping in mind too, your little one isn’t going to enjoy all the new foods you introduce them to. I’m sure there’s some foods you yourself don’t like and nothing could make you enjoy them. We all have our likes and dislikes and your toddler isn’t any different. So, if they try a food and are reluctant to eat it again, it’s more than likely they just don’t like it, rather than them trying to be difficult. You probably already know how important routine is with young children. Just like you would have a set routine for bed time, it’s important to have one for meals too. 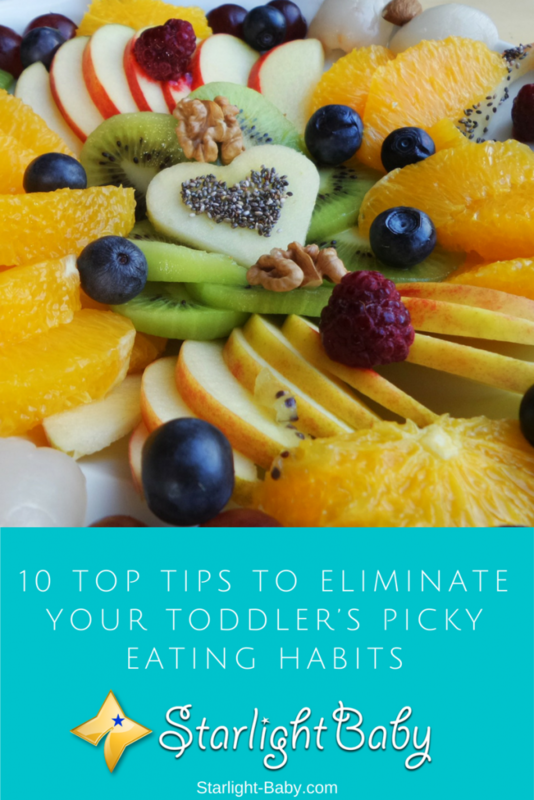 If you don’t, your toddler could end up filling themselves up on snacks, juice and milk in-between meals; making them more reluctant to eat even the foods they really do enjoy, never mind trying something new! Encouraging them to eat at the same times each day will reduce meal time battles significantly. Provide water instead of milk and juice in-between meals to prevent your little one filling up before eating main meals. The hungrier your toddler is at mealtimes, the more chance there is they will eat what is put in front of them. With this in mind, it also helps to encourage them to exercise a lot throughout the day to build up a healthy appetite! Due to work commitments, it isn’t always easy to sit down as a family and eat together. However, even if it is just you and your toddler, eating with them rather than feeding them separately can help a lot. This is especially true if you eat the same things. Now obviously, if your toddler largely eats crackers for their meals, you’re not going to be eating exactly the same foods. However, if you want them to eat different things, you’re going to have to be prepared to eat them too. Cooking separate meals is a bad idea as your little one will pick up on the fact that they are being forced to eat something that nobody else is eating. Young children lead by example, so if they see you eating something, they’ll be more inclined to eat it themselves. Following on from the tip above, toddlers will learn a lot from their parents, but when it comes to trying new foods, nobody is more influential than their friends. Experts recommend inviting your toddler’s friends over and having taster sessions. If your little one sees their friend eating something new, they’ll want to try it too. They will see it isn’t a big issue and be curious to find out what the new food tastes like. This may not make them necessarily love the foods they try, but it does make them less fearful of trying new things in the future. Praise is one of the most effective ways to encourage your toddler to eat new foods. All toddlers love attention and they crave your approval, even though it might not seem like it! So, when they are brave enough to try something new, make a big deal out of it. Let them know it’s a great thing to try new things. Even if they don’t like it, the point is they were willing to try and that deserves recognition. What you need to remember is toddlers see any form of attention as a good thing. So, if you only tend to give them attention when they refuse to try new things, they could start refusing foods just to get that little attention. Toddlers have fairly short attention spans. When it comes to meal times, it’s easy for them to quickly get bored after one or two mouthfuls of something. A good way to eliminate this problem is to give them a savory course, followed by a sweet one. Now, the sweet one can be apple slices or a piece of banana, it shouldn’t always consist of a dessert. It’s also important to avoid using the sweet as bribery. It makes sense to try to encourage them to eat their savory meal before they are allowed the sweet course. However, what this can do is make your toddler dislike the savory course even more, leading to further issues later on. If you are serving up two courses, also make sure they are a little smaller than one main course would be. If they refuse to eat something, you may wish not to offer up something different instead. What this does, is it tells your toddler they don’t have to eat what they are offered first. Instead, if they refuse, they could end up with something they actually want to eat. This in turn will lead to many mealtime battles. You could give them two options of foods you want them to eat, such as two new foods they’ve never tried before and they get to decide which one they want. Just don’t cave in and give them what they always have. Just because your toddler refuses a particular food one day, it doesn’t mean you should stop trying. Their taste buds will change and develop over time. So, a food they can’t stand today could be something they end up really enjoying another day. It’s estimated that toddlers sometimes need to be encouraged to try the same food between 10-15 times before they’re prepared to give it a go. So be persistent and it will pay off. The last and by far the hardest tip is to be patient and stay calm. All toddlers go through a picky eating phase and that’s exactly what it is – a phase. It’s officially known as food neophobia and basically means your little one has an actual fear of trying new foods. It typically starts at age two and they’ll want to stick to foods that they know they love. As it is an actual fear, the best thing you can do is be patient. The more stressed out you become, the more anxious your toddler will get at meal times. If you’re constantly angry and frustrated at mealtimes, your toddler will pick up on it. So stay happy, calm and if you feel yourself getting stressed, take a few deep breaths. Overall, dealing with a picky eater can be frustrating but the tips above will really help to make it that little easier. Remember, it’s just a phase and it won’t be long before it becomes a distant memory as long as you persist and follow the advice above. Of course, if you’ve managed to find something else that works, it’d be awesome if you could share it in the comments, because surely there are even more things we haven’t thought of! That’s a great array of suggestions. In addition to that we also try to serve their food in a nice package. The way we arrange their food will encourage them more to eat. Aside from the nice presentation, make sure that toodlers can bite or chew the foods served. Eating together with them is a very nice way, aside from having fun with your little ones that serves as your bonding moment with them. Thank you for mentioning food presentation, sweetpot81. Good suggestion! That is very true – when food looks attractive and yummy, a child becomes curious and would want to try it! Giving up isn’t an option in getting your baby to be comfortable with eating varieties of meals and not being picky. The option of not giving up seem very good to me in getting the baby master eating the food offered them. Over a long period of time and with such food being given to them on daily basis, they would turn to start enjoying it and get used to it. Thanks for these tips given here, they would definitely come in handy for parents. My baby is 11 months. We introduced solid food at the age of seven months. Before that, we were feeding only milk, mother’s milk, cow milk and sometimes formula milk. When we started feeding solid food, we introduced whole grain (equal proportion of wheat, rice, corn, soy, lentils, and barley). When he was little older, we started feeding him bananas and orange juice (homemade). We also tried feeding him chicken soup, he liked it, however, we were afraid that he might not be able to digest properly. Now we are thinking to introduce eggs. You’re on the right track, vinaya. By introducing solid foods little by little, your baby will eventually get used to it, including his digestive system. Just serve small portions, especially when introducing a new food. Try to monitor his reaction – if he likes it a lot, then you can add more portions next time. Watch out as well for possible allergic reactions to certain foods.